My brother has good taste in wine, though he’s perhaps less interested than I in breaking down all the specific flavors a given bottle may convey to its consumer. This Tempranillo from Spain’s Rioja region is a good example–a bright, fruity red that finishes easy and comfortably for your Saturday night dinner. He picked it because it sounded good, I’m sure; I’m describing it here on Notes because he was right. 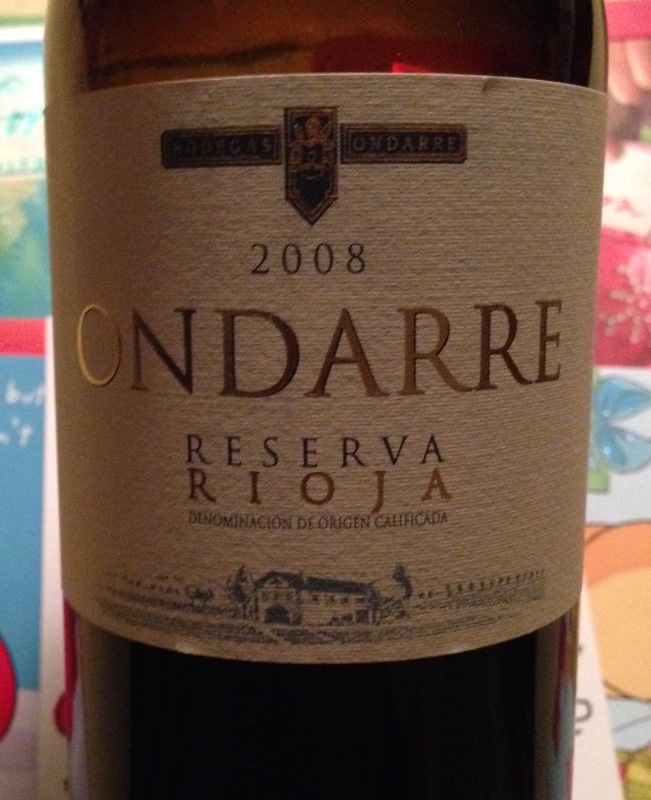 2008 Ondarre Reserva Rioja, Spain. So what steak, what beef did we consume with the 2008 Ondarre Reserva Rioja? We actually cut against the grain and, after sampling it first during hors de oeuvres, continued on with it for our main course. Mom pulled out a gem of a shrimp dish that included butter, olive oil, lemon zest, garlic, red pepper flakes (some welcome heat! ), and fresh minced rosemary. The kitchen smelled fantastic at this point, and the entire dish was roasted in the oven beside slides of lemon and ultimately finished with salt, pepper, and squeezed lemon juice. All that goodness we ate with a side of cous cous and peas, plus the Ondarre. The red didn’t quite blend with the sauce on the shellfish but both the wine and the shrimp entre stood loud and proud by itself. Bearing the Reserva title from the Rioja region, we know that the grapes were oak aged for at least three years. With three of us drinking this wine for the evening, it did not age long in our glasses–a good thing. This wine is solid. It can serve as the foundation for a good evening of wine drinking and certainly for smiles among family members enjoying a visit at Christmas. May yours be merry and bright…and thanks Steve for the nice contribution!